I am writing to report an incident that occurred on February 14th, 2010, when I took a cab from NEIGHBORHOOD ONE to NEIGHBORHOOD TWO. 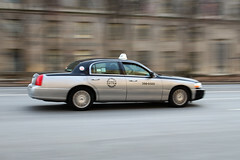 I was picked up on the corner of X STREET at TIME by Cab Number XXXX from Cab Company XXXXXXX, driven by DRIVER NAME. I told the driver the address that I wished to go to (XXXX YYYY Street NW) and off we went. When we arrived, the driver told me that the fare was $30 due to Snow Emergency, when the meter only read $15. I paid the cabbie what the meter read, and exited the cab, with the cabbie threatening me all the way. I hope that the Commission will take my complaint seriously and file charges against the driver. I am still in shock that I was physically threatened into give $25 for a 3 block, 2 minute ride (i didnt know the final address was that close)…. How is one supposed to get a angry cab driver’s name? I doubt they would be nice enough to give it to you if they are already upset. Are cabs required to write their name on the back of the front seat, or something like that? The registered driver is on their license card, which MUST be on display in the cab. Usually, it’s on the passenger side visor. On the other hand, if they’re already trying to gouge people like this, they likely are removing or covering that license up anyway to avoid being reported. Unless they’re really dumb drivers, that is.